-What is best for the pool aesthetically? -What is best for the maintenance and cleanliness of the pool? -What is best for pool safety? 2- If it is a “Safety Cover”, creates one more additional “layer of protection”. If it is NOT a safety cover then it provides absolutely no safety. That’s it. It does NOT keep a pool from freezing. 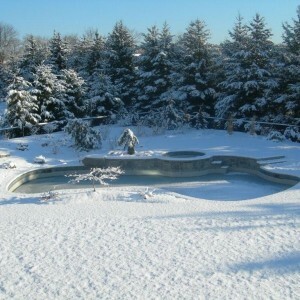 We have plenty of clients who choose to not cover their pools; they still winterize the pool (plumbing, fixtures, etc.) they simple choose to not put a cover on it. If you will be looking at the cover all winter (is your pool directly in view from the kitchen? ), the aesthetics of a safety cover (custom made to the exact shape of the pool) may be important. How about safety for the kids or pets? Another reason to have a safety cover. In my opinion, the best covers FOR THE POOL are the tarp-style covers. More pools open clean and clear after winter down-time with such covers than with any other. On the other hand, they are NOT particularly safe or pleasant to look at. What is your reason for covering your pool and what are you expecting from your cover? A tarp styled cover keeps debris out of the pool better than the “safety covers”. The water tubes along the perimeter seal the edge so the wind cannot blow the debris into the pool (do NOT use cement blocks or similar as if/when they get dragged into the pool they can cause damage). Water tubes break, tarp covers are made more “economically”, and they look terrible (relatively speaking), but they will make for the easiest spring clean up. Safety Covers are safe. End of discussion (when installed properly of course). They are also more aesthetically pleasing. But due to how they are held down (a strap/spring/anchor every “x” feet), the wind WILL blow debris into your pool over the winter. No matter how clean your pool is when the pool is winterized, some debris will get under the cover. Also, if the cover is a mesh material, water will get through the cover (rain, snow melt) and into the clear and chemically treated pool water. Fine debris will also make its way through. All of this ‘stuff” will saturate the chemically balanced/treated pool water and contribute to potential algae/cloudiness in the spring. The covers look great (until the snow covers them) as leaves and larger debris dry up and blow away, but the pool water is not always as clean as people want come spring. Pumping water off of a pool cover during the winter is another issue that comes up when considering which option to go with. Pumping will LIKLEY BE REQUIRED at some point in the fall or (depending upon the snow/ice) over the winter. The water level in the pool was lowered so as to keep water off of the tile and out of the skimmers (minimize the potential for ice damage). As rain and snow melt build up on or under the cover, some “winter maintenance” is recommended. With a tarp cover (or any solid material) it is easy to tell when a cover needs to be pumps. One looks at the cover and can see the build-up. Plug in a pump and get the water off of the cover. With a mesh material cover, water passes through the cover and one cannot simply look outside and see that water pumping is required. You will have to go “to the cover” and look through it to see if pumping is required. Removing a strap can also be a struggle for some homeowners so pumping with a mesh cover is not as straight forward. You will need a COVER PUMP. One does not necessarily want a stronger pump, as they tend to be heavier with larger discharge hoses that may cause the cover to sag too much. We recommend and supply the same Little Giant Pump we have been selling for many many years. Ultimately, a winter cover pump needs to pump consistently but not necessarily quickly and it needs to be easy to handle. Choose wisely. We also offer winter maintenance services. After the pool is closed for the winter, most clients pump the covers themselves but others prefer to contract a service technician to perform maintenance and check the pool monthly in preparation for the inevitable icing over of the cover. Once the pool freezes, there is generally nothing to do due to the snow cover. We can drill through the ice and pump from underneath it but that creates another set of issues. Normally pumping off water in the fall, before freezing temperatures arrive, insures that once the ice comes all is well and there is nothing to be done until Spring. Unfortunately (or fortunately), we live in the Northeast and winter/ice is just a part of our experience. We prepare as much as possible and wait for spring. I do not mean to be unhelpful but there is never a straight answer in the search for the “best cover”. Some are inexpensive, some are safer than others, and each has their benefits and limitations. If safety is an issue, it is an easy decision to buy a “safety cover”. If cost or water clarity/debris is most important, then you can save some money and have a clean pool in the spring by using a tarp. 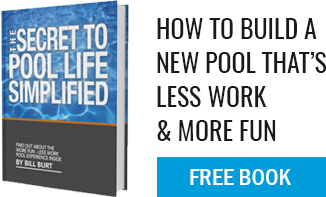 Ultimately, weigh your options and speak with a POOL PROFESSIONAL. Sometimes you do get what you pay for.